Divided into six chapters, fifty-five artists talk about their material of choice. Does living in the digital age intensify our relationship with the material world? 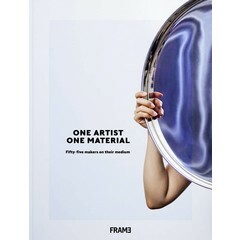 The success of One Artist, One Material, a regular feature section that has appeared in Frame magazine for over a decade, suggests that it does. An interview with a maker about his or her chosen material, it first appeared in Frame 65 (May/June 2007) and is still going strong. This book contains 55 of those interviews. Within the deceptively simple formula, dramatic, amusing, perplexing and humbling stories unfold. The subjects are enthusiastic about their chosen material to the point of monomania, spending long hours on eBay procuring vintage furniture (Michael Samuels), or behind a microscope arranging diatoms, which are invisible to the human eye (Klaus Kemp), or tracing huge yet transient patterns in sand or snow (Jim Denevan and Simon Beck, respectively). A material’s simplicity often bears no relation to the complexity it expresses in the hands of a creator. Magpie feathers are shaped into disturbing spatial deluges by Kate MccGwire; white balloons are used over and over again by Charles Pétillon to undermine our perceptions of everyday reality. Over One Artist, One Material’s lifetime, art and design have been steadily converging, with pop-up shops now often appearing to be art installations (and occasionally vice versa). Pressures on budgets and increasing awareness of sustainability issues have led designers to take a new look at materials, opting for recycling, making, and even growing their own. Handcrafted items have meanwhile found a new popularity and relevance. All of these material trends are prefigured in One Artist, One Material. Includes the use of any kind of material; from glass and water to dead animals. • Inspires creatives from all disciplines to explore new ways in which to use materials and elements.